Storing logs in your garage is perfectly ok – providing they’re already dry. It’s a very bad idea to keep freshly cut or partially seasoned logs in a garage, as there simply isn’t enough fresh or flowing air to help them dry out. Fresh or partially seasoned logs will release their moisture into your garage and you will notice mould spores appearing all over other items quite rapidly during warm conditions. It’s important to emphasise that logs that are already very dry and ready to burn such as our kiln dried logs can be kept in garages without any issues whatsoever. The best method of keeping logs in your garage is to make sure they aren’t touching the floor – simply a precaution for those with garages that tend to accumulate damp on the floor. We thoroughly recommend storing your kiln dried logs in your garage or outside in one of our log stores. As mentioned in our other articles on log stores, it’s crucial the store you purchase is slatted and not solid, with the front of the log store open and not closed. The reason for this is that logs, even when kiln dried, still need to breath when stored outside; this ensures good ventilation and avoids problems with humidity and mould growth. The same principle applies if you are wondering if your log store should be with or without doors. There is simply no reason for a log store to have doors; if some water makes its way in the last thing you need on a warm day is to create a greenhouse effect within your log store. Having a log store with doors encourages humid environments in which mould and various insects can thrive. It is much better for your log store to be slatted and open – surface rain will simply evaperate with the wind, and you won’t find any nasty surprises when taking your logs out weeks or months later. Our log store is slatted and open fronted, making it the ideal storage solution for your logs. The size of your log store is an important consideration when choosing your store. If your store is too small, you risk not being able to hold enough logs to last you the season. This results in multiple purchases of firewood and not being able to take advantage of the savings purchasing in bulk offers. Go too big, and you may simply be sacrificing important space and wasting your money on a log store that’s far too large for your needs. 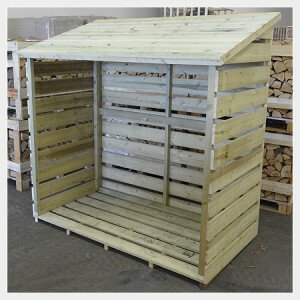 To keep the decision simple we offer one size of log store which we believe is ideal for any requirements. The Small Log Store – one will hold the logs in our small crate, and two of them will hold the logs in our extra large crate. For more advice such as where to position your store, or for more details on our log stores please visit our log stores section. We are often asked by customers who purchase our log stores which direction they should face, and it’s a good question. Ideally your log store should be situated in a position where the open front receives maximum sunlight during the day to help evaporate any surface rain quickly, therefore facing south. Careful consideration should also be given to the location. As logs need to breath, placing your log store directly up against a fence or garage is not a good idea, as good ventilation is required all-round. We would advise keeping your log store at least a foot or two away from a fence or garage. We hope this has helped you understand which way your log store should face. If you are considering purchasing a log store, make sure to view our small log store.